When I introduced this acoustic bass model in 2005 the objective was to build an instrument that had an upright bass vibe, and so it does! 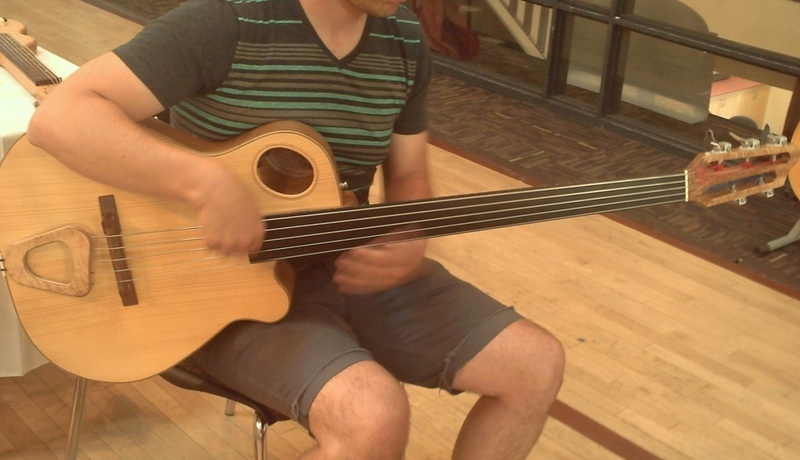 "His fretless acoustic bass really shines, with deep, clear tone and excellent sustain. The large body is shaped similar to Linda Manzer's Wedge guitars, creating a big tone without playability issues. It's very well executed, easy to play, and sounds great." 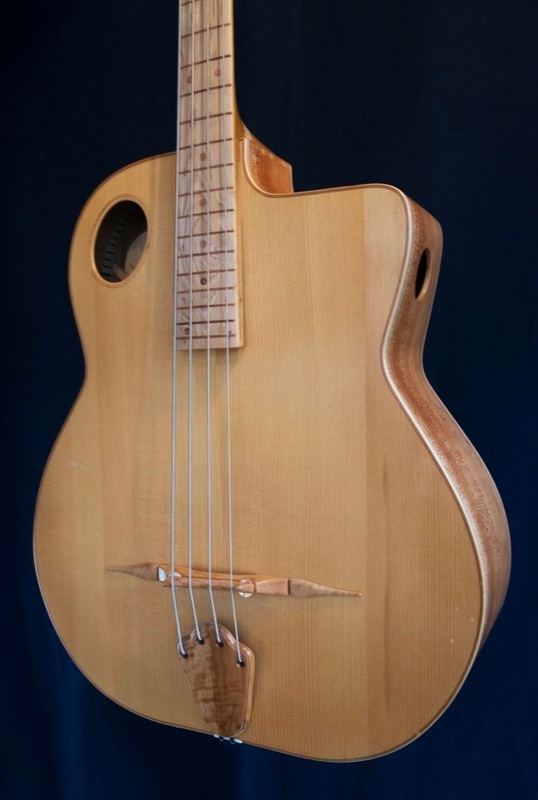 Lower bout widht: 18 1/2"
String spacing at the bridge: 2 3/8"
This ergonomic fretless acoustic bass is made from curly maple and as most of my instruments, the soundboard is red spruce, while the fingerboard, bridge, tailpiece and headstock overlay are made of curly hop hornbeam. 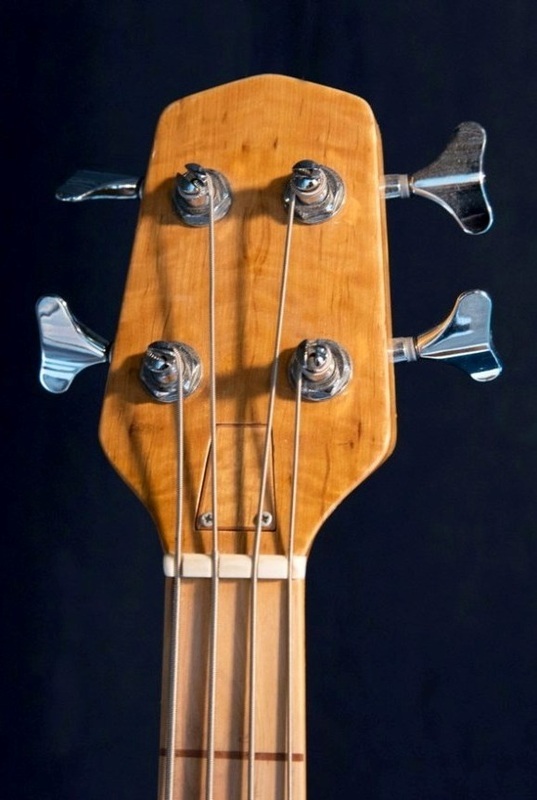 Notice the slotted headstock and the exquisite flame pattern of the fingerboard. This maple bass now lives in Japan. 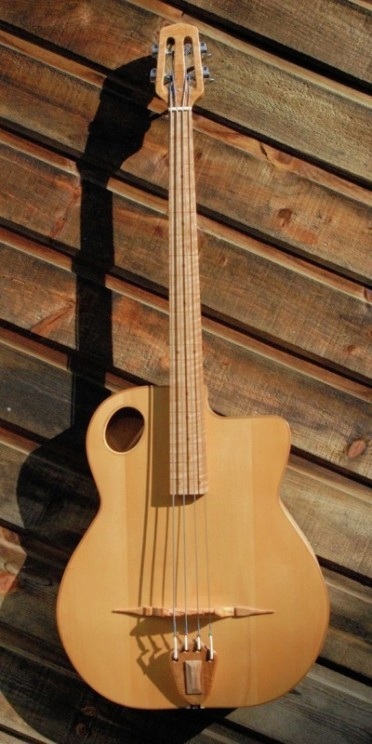 This cherry acoustic fretless bass is similar to the maple one above. The one inch deeper cherry body gives this bass a deeper sound with a better bass response. It is 6" deep on the treble side but only 3" on the bass side making very confortable and easy to play. The 14th fret neck to body joint combined with a bridge that is near the end of the body makes playing in first position very easy. You don't have to reach for those lower notes. * Awasos which is from abenaki dialect means "bear". Animals were important in their spiritual life.